Enter the total dollar amount of the funds you are considering investing in the mutual fund. Enter only numeric digits 0-9 and a decimal point if applicable (no dollar signs or commas). Enter the number of years you plan to leave the funds invested in the mutual fund. Enter whole numbers only (no partial years). Enter the percentage return on investment you expect to earn on the mutual fund (without the percent sign). The percentage you can expect to earn should be based on conservative expectations. As we have seen post Y2K, history is not always a reliable predictor of the future. Sure, over the past 20-30 years, money market funds, bond funds, and stock funds have averaged around 5%, 9%, and 11% respectively, but that is certainly no guarantee of what the future might hold. If the fund you are investing in has a sales charge (front-end load), enter the percentage here (without the percent sign). This information can be found in the prospectus of the fund. If the fund you are investing in has a deferred sales charge (back-end load), enter the percentage here (without the percent sign). This information can be found in the prospectus of the fund. Enter the total annual operating expense percentage (without the percent sign). Be sure to include any other expense percentages (12b-1 fees, etc.) that might apply. This information can be found in the prospectus of the fund. If the fund you are investing in is scheduled to convert from one class to another within the entered holding period, enter the post-conversion annual operating percentage and the conversion year in the fields below. If the fund is not scheduled to convert, leave both fields blank. After calculating all gains and expenses, this is how much your mutual fund would be worth at the end of the holding period if your rate of return expectations prove to be true. This is the before-tax effective annual yield after accounting for all sales charges and operating expenses. If the field contains only # signs, it means the mutual fund calculator could not find a percentage match within 10,000 tries. This is the before-tax net gain on the investment (value at end of holding period minus initial investment). This is the total of all sales charges, deferred sales charges, and annual operating expenses incurred from the beginning to the end of the entered holding period. This is the earnings you might lose out on due to having to pay the fees associated to investing in the mutual fund versus being able to invest the cost of the expenses. The mutual fund calculator accumulates these lost earnings as fees are scheduled to be paid throughout the holding period, and are based on the entered expected rate of return of the mutual fund. This is the combined total of the sales charges, operating expenses, and foregone earnings for the holding period. This calculator will calculate a fund's after-expense growth and equivalent annual yield. 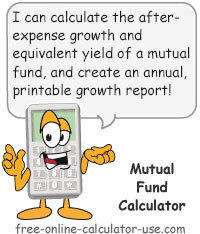 You can then print out the results -- including an annual growth chart -- that can then be used for mutual fund comparison. If you don't know the answer to "What are mutual funds? ", or you're not sure how mutual funds work, or you don't know when and how to buy mutual funds, it may be well worth your while to visit the Learn tab for a basic definition and various explanations to help you better understand mutual funds before using the calculator. Enter the amount you have available for investing in the fund. Enter the number of years you plan to leave the money invested in the fund. Enter the anticipated percentage rate of return. Enter the front-end load percentage if applicable. Enter the back-end load percentage if applicable. Enter the total annual operating expense percentage, combined with any other expense percentages that may apply. If the fund is scheduled to convert to a different class during the entered holding period, enter the year number and post-conversion percentage. Tap the "Calculate Results" button. This will calculate the future, value and effective yield for comparison purposes, as well a generate a button to open the results in a printer friendly window (located at the bottom of the results). If you would like to print out a copy of the results, clicking this button will open the results in a new printer-friendly page for printing. If you would like to associate the results to a particular fund, enter the name of the fund in the field above the button. What mutual funds are, how they work, and when and how to buy them. The basic definition of mutual funds: A big pool of investment money created by a large number of small investors who combine their funds to gain the advantages that are normally reserved for big investors. This pool of investment money is managed by a professional who gets paid based on the amount of money they manage (some also get paid based on the fund's performance). And finally, each fund is geared toward a specialized kind of security (index, growth, income, sector, etc.). This means you can choose the type of fund based on your own investment goals and risk tolerance -- with the assurance that the fund will maintain its focus on securities that fall within that predefined type. A wealthy investor can afford to purchase a diverse portfolio of securities (stocks, bonds, short-term money market instruments, etc.) -- thereby reducing the risk of losing money if a segment of the economy moves in the wrong direction. With mutual funds, small investors can afford to do the same thing by taking a small amount of money (as little as $500 or less) and investing in a mutual fund that in turn invests the large pool of money into a diverse selection of securities within the framework of their advertised type. Another of the many advantages of investing in mutual funds is that you can sell or add to your shares at any time. Plus, you can also switch from one type of fund within a fund family (different types of funds managed by the same company) to another type of fund at no cost -- and with just a phone call. While mutual funds offer many advantages it's also important to realize that mutual funds are not federally insured -- even if you purchase them through a bank. Also be aware that management fees are charged by all mutual funds regardless of whether or not your mutual fund investment is gaining money or losing money. Your vote with your money counts more than your vote on a ballot. Basically, when you invest in a mutual fund you transfer money to the fund in an amount greater than the minimum required (varies from one fund to another). If the fund has a sales charge (front-end load), the fund deducts the charge from your initial payment and then issues the number of shares equal to the remaining balance divided by the NAV per share (Net Asset Value per share). The Net Asset Value (NAV) is the fund's assets minus its liabilities. The NAV per share is calculated by dividing Net Asset Value by the number of shares outstanding. So, as a simple example, suppose a fund's assets were $150,000, its liabilities were $50,000, and the fund had 10,000 outstanding shares. In that case, the NAV would be $100,000 ($150,000 - $50,000) and the NAV per share would be $10.00 ($100,000 ÷ 10,000). Continuing with the example, if you transferred $1,000 to the fund that had a 3% sales charge, you would be issued 97 shares of the fund ($1,000 - $30 sales charge = $970, ÷ $10 NAV per share = 97 shares). From there you can see that if the NAV rises (assets increase by a greater margin than any increase in liabilities), so does the NAV per share. So if the fund's NAV per share were to increase to say $12, this means you could sell your 97 shares back to the fund for $1,164 (97 x $12 NAV per share) -- leaving you with a gain of $194.00 ($1,164 - $970) -- less any deferred sales charges (back-end load) and annual operating costs. Since it costs money to run a fund, all mutual funds charge an annual operating expense fee equal to a percentage (usually 1%-3%) of the value of your shares. Some funds may also charge for sales and marketing (referred to as "12b-1" fees), management, and "other" expenses. The amount of these charges and fees can be found in the prospectus that mutual fund companies are required to provide you with. Of course, all of these fees will serve to lower your rate of return, so it's important to shop and compare the fees charged. Before investing in mutual funds, or any other type of risk-bearing investment, you should have 3-6 months of income saved up in an emergency fund and have no outstanding high-interest debt. If you don't have a fully-funded emergency fund I suggest you allocate all investment funds to creating that all important financial safety net. Or if you do have a fully-funded emergency fund, but you have unpaid high-interest debt, I suggest you invest in your debt before you consider purchasing risk-bearing mutual funds that can't match the safe, tax-free, high rate of returns you can achieve with accelerated debt payoff. You can buy mutual fund shares directly from a fund. These are typically referred to as "no-load" funds -- meaning there is no sales charge for purchasing the shares since they don't use a commissioned sales force to sell their shares. In this case you will need to do your own research in choosing which fund to invest in. You can buy mutual fund shares through brokers, banks, financial planners, and insurance companies. These are typically referred to as "load" funds -- meaning there is a sales charge since they need to compensate those that are selling shares on their behalf. In this case you can get recommendations from the seller as to which funds to buy. Just be aware that they may recommend funds based on how much commission they make. Also be aware that you will need to earn a higher rate of return in order to offset the sales charges. You should now have a rough understanding of what mutual funds are, how they work, and when and how to buy them. For more in-depth study I suggest you begin by visiting the Securities and Exchange Commission's (SEC) section on Mutual Funds (opens in a new window).